Lyman is one of the industry leaders in trimming and case prep innovation. Lyman has introduced a case trimming system for the reloader interested in economy or preferring to have an individual precision hand system for each caliber. The E-ZEE TRIM case trimming system allows the user to trim cases by hand or with a power attachment (included) to precise pre-set length - no adjustment of measuring needed. The trimmer comes with a case locking device, cutter, trim-to-length pilot, cutter head and both hand and power trimming adapters. 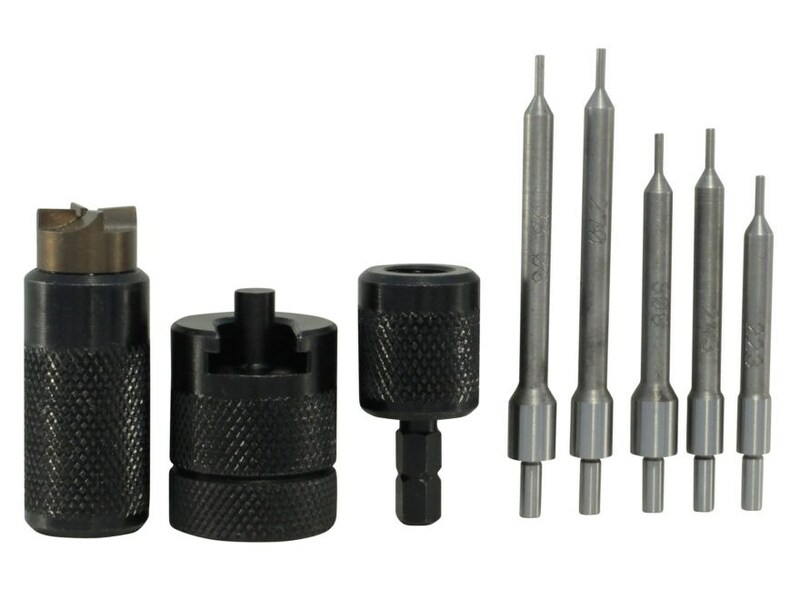 The trimmer works with any standard shellholder including Lyman, Redding, RCBS, Hornady & Lee Precision. Assembles in seconds and you are ready to trim cases. The E-ZEE TRIM system comes in three practical variations. When it comes to reloading bottle neck calibers, trust the Lyman E-ZEE TRIM Hand Case Trimmer for precision trims. In the E-ZEE TRIM Rifle Set 5 of the most popular caliber pilots are included along with all of the standard accessories. .223 Rem, .243 Win, .270 Win, .30-06, and .308 Win.